Mardi Gras is without question the greatest and most colorful party in the world and gives you and your guests a great chance, to awe everybody around you. The most vital components to any Mardi Gras are invitations, favours, decorations and, obviously, Mardi Gras beads and masks. To begin with, sit with your family and/or the event planning team (if it is a corporate party) to plan out the party. Get a general view of Mardi grass party favours, decor, costumes, food, entertainment etc. After you have determined all of these components decide about invitations. Remember, your invitations should match with your party theme. The extra effort can leave your guests excited and will in an instant pass along the atmosphere of the party. Choosing custom Mardi Gras party invitations is an important undertaking you should be concerned about. Once you have decided the theme, then your Mardi Gras invitation cards must complement your theme, which is easy if you shop online. Also, these websites have a large array of invitations wording ideas for Mardi Gras parties that will make sure, your invitations are novel and not at all like any others that may be sent out. The most fun and important part of a Mardi Gras party is Mardi Gras invitations. Invitations to a Mardi Gras party should be as fun and bubbly as the week-long event itself. Like, if a business is setting up a Mardi Gras party and inviting top clients then make a point to budget an adequate sum of money on the party invitations. Furthermore, Mardi Gras invitations for a home party need not be as big-budget or costly. The trick is to make the invitations bright, vivacious and colorful while injecting the thrill in the guests. So, a buzz will be created about the event! When doing the decorations, take into account your theme and the traditional colors, like gold, purple, and green. Balloons, crepe paper, large colorful banners and other sundry items are easily found at special online party stores. By inculcating colorful paper products and tablecloths you are surely going to create an exciting and festive air. The Mardi Gras party invitations have to be representative of the traditional colors of Mardi Gras - purple, green and gold. For a business gathering, these invitations need to be professionally printed. 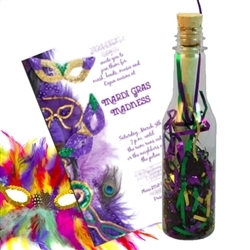 To add a touch of fervour to the invitations choose the Mardi Grass invitation in a bottle. A beautiful Mardi Grass mask themed invitation, finished with printed wording gets placed in the bottle. 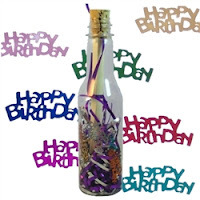 The bottle’s embellishments will include crinkle shred in purple, green and gold and some festive black mask confetti. Furthermore, you can pair up with a Mardi Gras mask, Mardi Gras beads, or a feathered boa, to truly make a thoughtful, unique mardi gras party favours. Thus, organizing your yearly Mardi Gras party doesn't need to be complicated, tedious, or tiring, if you begin early and allow websites to help. Your dashing, hip party invitations will set the mood and encourage the invitees to attend your celebration. A birthday party is a special event in any child's life and it gets festive by the loving presence of relatives and friends. Parents want their youngster's birthday event to be very special with one of a kind touches that catch the kid's interests and emotions. The fact of the matter is that children of any age love birthday parties. Organizing kids' birthday parties can involve a lot of favor. Planning for a child's special day starts with the selection of birthday invitations, which assume a crucial part in a memorable birthday celebrations. Youngsters' birthday invitations can be simple yet exquisite ones, which clearly let guests know about the event that you are planning. Unique children’s birthday invitations not only informs about the time, place, and date of the occasion. But, additionally about the theme of the party, like the Pirate theme. They need to be delivered to your guests no less than a couple of weeks in advance. Many party supply websites and online stores offer you the option to buy small size glass or plastic clear bottles with cork stoppers. From the online stores you can also get white sand, sea shells, string wraps and optional extras, etc. Once you have all the materials it is easy to create your own fun sized invitations, customized according to your child’s party theme. Place them inside the bottles and deliver the invitations to all invitees by hand. Your guests will appreciate the effort when they receive the personalized invitations from you. On special occasions like your child's birthday celebration event, words alone aren't sufficient to express your personal feelings. Astonish the person who is close to you and your kids with a nostalgic message in a bottle gift. Ideal for birthday events, a message in a bottle is a souvenir that will be prized forever. Shop for exceptional gift ideas including bottles that contain pre-written messages, or ones that require personalization. Thus, allowing you the novel chance to show your sentiments. Customized unique children's birthday invitations and gifts fill in as lasting keepsakes for your friends and relatives. Unique and appealing invitations show your devotion and persuade the guests to participate in the event. This party season keeps on witnessing the Pirate Theme as top of the popularity charts. Many factors have contributed to this trend. The launch of one more blockbuster Pirates of the Caribbean movie, pirate centered TV shows, and a huge swath of books related to Pirates for all ages are the primary ones. It's anything but difficult to see that this theme has truly caught the imagination. 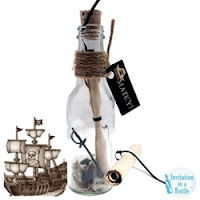 Get your pirate party under way by inviting your guests to the adventure, they will remember for the whole life with an intriguing Pirate invitation in bottle for your birthday party. Your guests will enjoy the fun treats they'll find, when they pop the bottom off their bottle. Each invitation will feature fun embellishments for them to wear to the party. For example, a pirate eye patch and a skull and crossbones ring. 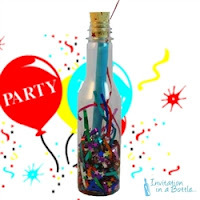 Simply fill out the party information on the rolled up paper invite, stuff it into the bottle with the embellishments, and sprinkle it all with a tinge of sand before you seal it up with the address labels. Sketch an oversimplified and stylised map of the region encompassing the venue for the party, as though it's a desert island. Make use of pirate symbols palms, pirate caverns, skeletons. Furthermore, place a pirate’s chest and a cross at the site on the map, where the party is to take place. You can incorporate most of the party details on the map in pirate language....lots of AAARRHs and avast and ahoy matey! Once more, some care should be taken to assure that the map has lots of genuine information. Moreover, the solution for the map could be incorporated on the back. These pirate parties invitations look great on tattered brown paper with burnt edges and by and large old. An option is to employ white paper and give it the look of aging, by recoloring it in a weak solution of tea. And after that leaving a couple of coffee granules to build on darker spots. These will stretch out with the suddenness in the paper. When dry crumble and tear as per the requirement. Bottle Invitations are one of the most well known wedding invitations in the market with different custom made choices. Moreover, the person receiving these finds the style enticing if they are, customized on recycled and high quality paper stationary. In any case, the most lovely aspect of them is the way that they add some additional emotion to any life event, especially a wedding occasion. To add a romantic vibe to the wedding, message in a bottle invitations are a great idea for couples, who might want to add a trace of mystery to the invitation. This form of solicitations are at present gaining many takers. In this invitation a bottle works as the container for the invitation paper to be placed in. The aspect that needs to be noted is that the invitee does not need to break the bottle to pore over the message. Some amazing bottling ideas can be small wine or champagne bottles and soda bottles in case you are in, for a recycling binge. Nonetheless, with a lace or a magnificent printed or colored paper, even a glass pop bottle looks very alluring. Life is extremely delightful, nonetheless, at the same time it follows a meandering, bumpy track, fraught with many twists and turns, good and bad times, etc. Furthermore, it is short. Therefore, there is beyond question almost no time to please and appreciate a man or woman, who means a great deal to you in life. 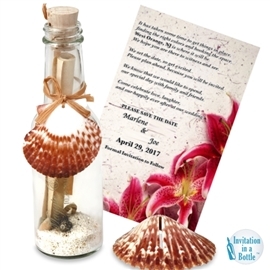 Be that as it may, with the message bottle invitations, it isn't easier said than done to express your feelings to individuals you feel fondness for. Furthermore, many times it happens that the man or woman, who is dearest to you may rarely hear the special words that shows, you love them. However, an easier way is declaring it with a message in a bottle. This is a beautiful style of message which is printed in a custom-made fashion, written on an attractive piece of paper, and afterwards placed in a lovely bottle. 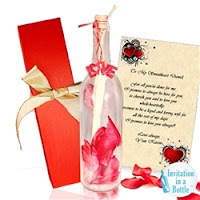 You can easily find the best message in a bottle invitations, on websites that specially deal with these. You simply need to select your message and place the order online. Corporate invitations are an indispensable piece of the business stationery in any organization. Different kinds of invites are given out to concerned people, organizations and very important personalities on events - like dinners, cocktails, change of business location, open house, retirement party, new venture, opening ceremony and so forth. Sending invitations personally is a warm gesture that portrays a feeling of inclusion for the recipient. The establishment of a business is, never a work limited with a single man or woman. Various individuals like employees, business partners and clients are associated with making a business succeed in the long run. You can't run the business alone, as you need to maintain associations with everyone involved. Especially, with individuals to whom your business decisions by implication influence. Vintage business invitations are given out on many events, beginning from fundraising events, workshops to commemorations and open houses. As there are a variety of events and each of them is distinctive, in nature from the other. So, generic invitations will never interest or entice the other individual to go to the party. The solicitations actually must be as personal as they can be. If that isn't achievable, then, in any event, the invites must be of high quality and be stirring, so the recipient waits anxiously for the occasion. So, having looked in every place without success, for a design that you loved that wasn't just commonly below average. 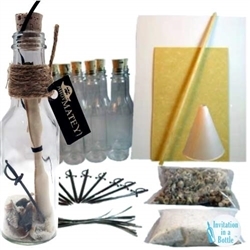 Here is a unique but vintage way to invite guests that you may try - called "message in a bottle" invitation. Giving out invitations, in this way is genuinely personal but seems attractive to the receiver. However, the planning takes a while since you need to check out an assortment of designs before you find the final perfect work of art. You should visit websites in the regard, to view an array of finished designs. Guests are generally excited to receive this kind of vintage business invitations. Many of them even like to keep them as a showpiece in their living room. The bottle invitations are dissimilar to the quotidian paper invitations. Actually, they help to give the entire process some theater. Elements, for instance, coconut scent, and burned edges help to create allurement in the receiver. Finally, the objective behind your invitations needs to be featured properly, so the recipient does not misjudge. Furthermore, customize the card using classy graphics. Lastly, use both sides of the card yet ensure there is no undesirable information on it.